On 11th December 2008 TanguerIN will again host what has become a traditional Tango ball on the occasion of the Day of tango. The Ball will take place in Hall 1 of the Central Military Club in Sofia. As in previous years the Ball will feature a special showcase by tango dancers from Bulgaria. This time, instead of the usual presentation of the tango clubs in Bulgaria, the organizers have decided to present dancers who had never danced in past editions of the event. During the ball there will be demonstrations by Adrian Zlatanov and Stefka Karastoyanova, Stoyan Hristov and Aneta Stoeva as well as a demo presented with the assistance of SofiaTango. The music will be selected by DJ Ivo from TanguerIN and wine lovers will be able again to endulge themselves with the wines from the special Tango series by Rousse Winery. 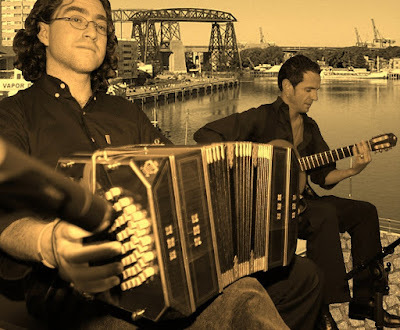 As part of the celebration of the Day of Tango in 2008 tango lovers in Sofia will be treated to a live concert of authentic argentine tango performed by guitarist and singer Sergio Gobi and bandoneonist Guillermo Destaillats. 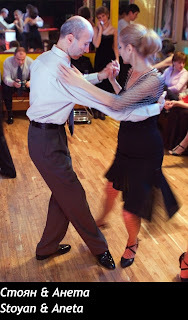 Both are Argentineans who live in Berlin and who play tango music all over Europe as a duo or as part of one of the many tango formations of which they are part. Their repertoire is ecclectic like the tango itself, they play traditional and contemporary tango music including their own compositions. By mixing yesterday's and today's tango their interpretations offer an interesting musical trip, a pure unrefined perfomance for true lovers of the genre. And all this in the chamber format of the duo, which creates a sense of intimacy, a friendly relationship between musicians and audience. The concert will be followed by a milonga until midnight in the lobby of the House of Cinema with DJ Mala. Rousse Winery will once more taka care of the wine. Sus ojos se cerraron y el mundo sigue andando (English title: Tangos are for two) by the Spanish director Jaime Chavarri depicts Buenos Aires during the 1930s, the emerging of the Golden Age of tango, the time of the great Carlos Gardel. The movie presents the music of Gardel and moments of his life in an original and unusual way - by following an imaginary love story of the young Spanish Juanita and an obscure tango singer Renzo. She lives for the music of Gradel and discovers in Renzo a striking resemblance with her idol. Seduced by the young singer, Juanita leaves her fiancee intending to turn Renzo into a double of Gradel. Obsessed by irresisitble passion mixing contradictory feelings, both embark on an adventure, which leads them to share the destiny of the real Gardel and to re-wright history.